Nourishing Israel is based upon the findings of Dr. Weston A. 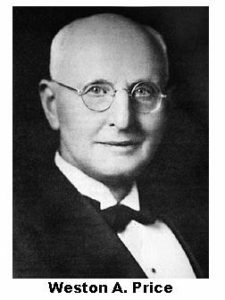 Price (1870-1948), an American dentist who discovered the “secret” to good dental, physical, and mental/emotional health. The “secret” is good parental and individual nutrition. Weston Price, taken aback at how his patients’ dental and physical health were deteriorating, was anxious to find the cause. A researcher, he approached the problem with both clinical and laboratory research methods to discover the underlying cause of their poor teeth and health. After a while he realized that the evidence was pointing to the absence of important factors in the modern diet, rather than the presence of harmful factors. It was at that point that he decided to find answers by studying populations with healthy teeth. Price traveled the globe, visiting indigenous and native populations who were fairly isolated and still eating their native diets. Each of these racial stocks also had a subset of the population that had begun eating a Western diet. The portion of the population still eating their native diets became his control group, and he studied saliva samples and the dental and overall health of both populations, and conducted a chemical analysis of the foods of the isolated groups and the foods of modern civilization. 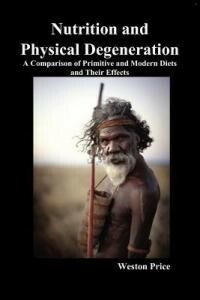 Price discovered that the native foods eaten by the isolated populations were far more nutrient dense than the modern foods. 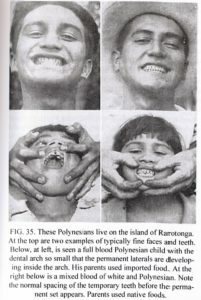 In the first generation that changed their diet there was noticeable tooth decay; in subsequent generations the dental and facial bone structure changed, as well as other changes that were seen in American and European families and previously considered to be the result of interracial marriage. By studying the different routes that the same populations had taken – traditional versus modern diet – he saw that the health of the children is directly related to the health of the parents and the germ plasms that they provide, and are as important to the child’s makeup as the health of the mother before and during pregnancy. 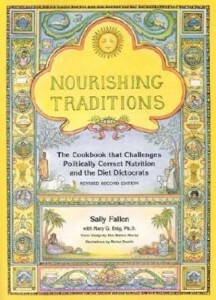 Price also found that primitive populations were very conscious of the importance of the mothers’ health and many populations made sure that girls were given a special diet for several months before they were allowed to marry. Another interesting finding was that although genetic makeup was important, it did not have as great a degree of influence on a person’s development and health as was thought, but that a lot of individual characteristics, including brain development and brain function, where due to environmental influence, what he called “intercepted heredity”. It will be easy for the reader to be prejudiced since many of the applications suggested are not orthodox. I suggest that conclusions be deferred until the new approach has been used to survey the physical and mental status of the reader’s own family, of his brothers and sisters, of associated families, and finally, of the mass of people met in business and on the street. Almost everyone who studies the matter will be surprised that such clear-cut evidence of a decline in modern reproductive efficiency could be all about us and not have been previously noted and reviewed. The health situation that Price described in the 1930s has only grown worse in the past 80-odd years. Today we are beset with more chronic diseases than ever before, for which modern medicine has no real answers, and our children are becoming sicker and sicker at younger and younger ages, both physically and emotionally. Price’s findings have given us much information about the effects that nutrition has on our growth, development, and overall health. He also provided information on what these isolated societies ate, how they prepared their food, and their consequent overall health. Considering the situation today, this knowledge is certainly important on a societal level, but sometimes change happens one person at a time. That’s why it’s important for each of us to make our own informed decisions on how best to feed our families. Nourishing Israel hopes to be a catalyst for this change.